The move was announced in a tweet by Trump on Sunday and comes amid pressure from China's government to back off the sanctions on ZTE, a major Chinese government-linked telecommunications giant. Alex Wong, deputy assistant secretary of state for East Asia, told a Senate hearing on Tuesday that the president issued guidance to Commerce to review the ZTE sanctions. "I understand the Commerce Department is reviewing that guidance," Wong said during a Senate Foreign Relations subcommittee hearing on Asia, adding that the guidance would be implemented in line with U.S. laws and regulations concerning the ZTE case. ZTE reached a settlement in March 2017 for violating U.S. export laws and paid penalties totaling $1.19 billion. 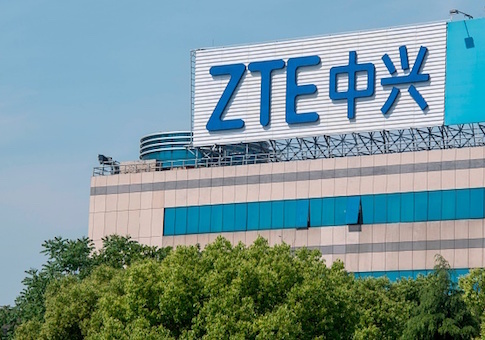 After ZTE failed to take action against company employees involved in the illegal exports, the Commerce Department last month banned U.S. companies from supplying goods to ZTE for seven years. The company produces telecommunications equipment that includes mobile phone handsets, servers, switches, routers, and cellular network gear. It reported $17 billion in revenue last year. ZTE announced last week the U.S. sanctions would force it to curtail major operations. China's government has pressed the Trump administration in recent trade talks to lift the sanctions and the president voiced sympathy for ZTE in a tweet Sunday. "President Xi of China, and I, are working together to give massive Chinese phone company, ZTE, a way to get back into business, fast," Trump said. "Too many jobs in China lost. Commerce Department has been instructed to get it done!" The comment took U.S. trade and security officials by surprise and prompted the president to say in a later tweet that ZTE buys a large amount of parts from U.S. companies and the concession was part of "a larger trade deal with China and my personal relationship with President Xi." Trade talks with China on plans for U.S. tariffs on Chinese goods and Chinese retaliatory tariffs are underway in Washington this week. A House Intelligence Committee report from 2012 revealed that ZTE and another Chinese telecom, Huawei Technologies, should be blocked from making any acquisitions or mergers with U.S. companies because of "the threat to U.S. national security interests." The companies are controlled by the Communist Party of China and could be used for operations to compromise U.S. communications infrastructures, the report said. The Pentagon recently banned Chinese telecommunications products from being used by the military over concerns about Chinese espionage related to the Chinese-made equipment. Intelligence officials have said China uses both ZTE and Huawei equipment for cyber spying operations. National Security Agency documents disclosed several years ago by renegade contractor Edward Snowden disclosed that the agency has succeeded in penetrating Chinese telecommunications equipment and used the gear for electronic spying around the world. Despite the U.S. ban, the Washington Free Beacon has reported that ZTE was selling equipment to the Pentagon and Homeland Security Department. A security firm, Kryptowire, disclosed in 2016 that Chinese phones are loaded with software that sends a user's data to Beijing. Bill Evanina, the director of the National Security and Counterintelligence Center, a federal counterspy agency, said in a Senate hearing Tuesday he would not recommend that anyone in government or the private sector use ZTE phones over electronic spying concerns. U.S. security concerns about Chinese telecom equipment also were voiced by senior U.S. intelligence leaders during congressional testimony earlier this year. The move to ease the sanctions sparked criticism from both Republicans and Democrats who said the leniency is undercutting Trump's get-tough approach to unfair trading practices by China and its theft of American technology. Sen. Marco Rubio (R., Fla.) criticized the plan to ease sanctions on ZTE and said the company has benefited from the theft of American technology. "This enforcement action against ZTE is not a trade issue," Rubio said on Fox News Channel. "It is because they got caught helping North Korea and helping Iran evade sanctions and they were punished for it." ZTE should not be operating in the United States and should not have easy access to American technology, Rubio said. Senate Democrats also criticized the president for appearing to give in to Chinese pressure on the ZTE sanctions. This entry was posted in National Security and tagged China, Cyber Security, Donald Trump. Bookmark the permalink.